Living in one place, studying one central ecosystem, working with a species that can be explained in one sentence…these things, among many others, will likely never play a role in Danielle Levesque’s research in the mammalian world. Ever since discovering in her undergraduate years that she did not need to be a vet to work with animals, an entire world filled with exciting research and opportunities presented itself to Levesque. 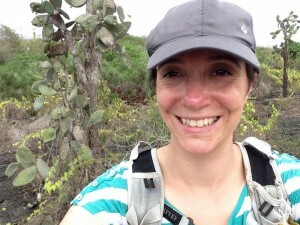 When it came to the significant decisions concerning her educational path, having already explored many vast opportunities around the world, Levesque was eventually led to her position as Assistant Professor of Mammalogy and Mammalian Health in the School of Biology and Ecology at the University of Maine. 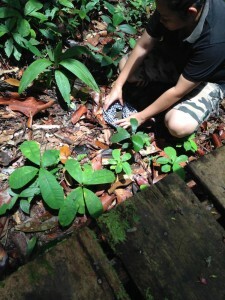 Mary Buloh Balang, Levesque’s research assistant, releasing a lesser treeshrew (Tupaia minor). When choosing which institution to attend for her undergraduate years, Levesque searched for somewhere the program would be opportunistic and exciting, yet small enough to be engaging and personal. After what seemed to be a fairly obvious choice, she chose the Macdonald Campus at McGill University in Montreal, Canada, studying Wildlife Biology. It was during her four years at McGill that Levesque was introduced to her passion: research in mammalian temperature regulation. It was only after discovering this field of research and becoming involved with the scientists on her campus that she realized she could not think of any reason to continue pursuing a veterinary career when this field of research as work existed. From then on, Levesque decided that she would try to stay in this field of research for as long as possible, and she never looked back. 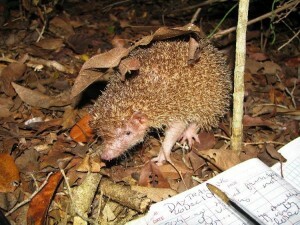 Only a year or two after being introduced to intensive mammalian work at McGill, Levesque took a semester abroad in Australia working with echidnas, which she labeled as “the weirdest mammal possible in terms of temperature regulation,” due to their thermoregulation being very variable and only constant when incubating, among other factors, making them a good model for what things must have been like for early mammals. Following her undergraduate years, Levesque chose to get her masters at Brock University in St-Catharines, Canada, where she took a more mechanistic approach focusing on chipmunks for the majority of her research. After that, she took a break from school and traveled to Africa to participate in the Meerkat Project research for six months before traveling to South Africa to get her PhD while doing fieldwork in Madagascar. 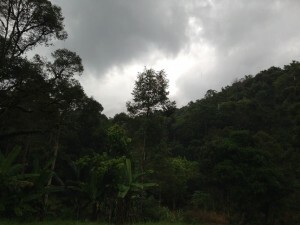 Finally, after much travel, exposure, and education, Levesque moved to Sarawak, in Malaysia Borneo for her post-doc, and it was there that she learned that there was very little data concerning animals in the tropics, and very rarely were these animals considered when scientific determinations were made concerning mammalian exposure and reactions to heat, humidity, and climate change. When Levesque contemplates the overall picture, what comes to mind is the manner in which people are trying to initiate change under a limited perspective. While any effort to improve the natural world is effort worth recognizing, Levesque realizes that understanding how climate history has shaped different patterns is the key component to triggering change from within. “People are putting together these big, wide-scale models about how animals are going to respond to climate change, and they are doing it based off of data measured from animals in climates like the one in Maine where they have a long history of being exposed to the cold,” stated Levesque. What we need to do in order to understand the bigger picture, she suggests, is recognize that animals with no evolutionary history of cold respond very differently to climate change, thus we cannot make progress in the right direction without taking into consideration the animals outside of the Northern Hemisphere. Before, and even during, her time spent in the tropics, Levesque realized that they had no idea how mammals and humidity interacted, which would prove to be an extremely significant factor in the comparison of environments and understanding climate change as a whole. In order to make future predictions for the ranges of species in areas of varying climate and humidity, there must be a broad perspective, and this was a task that Levesque was willing to undertake as the bulk of her work. Levesque is still taking time to settle in and adjust to the American Educational system here at the University of Maine. While she has taken her first semester to complete the more organizational tasks around her lab and teach her first semester of mammalogy, she plans to start up the research in her lab this coming fall. Using model species on campus, such as squirrels or mice, Levesque and those working in her lab will be testing the basic and fundamental concepts that were looked at very briefly in the 60’s but are in need of a fresh perspective and an updated set of details. Likewise to all ever growing scientific fields, in order to continue making advancements, individuals like Levesque must prompt change by applying their unique and knowledgeable experiences to the ideas worth reconsidering.